This is a three wire electric dryer plug that has sufferer heat damage. One of the hot prong at the bottom of plug has started to melt. This could be a sign of a bad cord. In this case the problem was in the 220volt plug. We knew the problem originated in the outlet because of the charring that we saw coming out from the connection. It looks as if there was a small fire inside the dryer outlet. Opening the dryer outlet we can see that the connection on the right of the outlet was the start of the fire. I also noted that there was lint build up in the plug and other parts of the dryer. A loose connection surrounded by highly combustible lint is a dangerous combination. After noticing all the lint build up the dryer vent was checked. 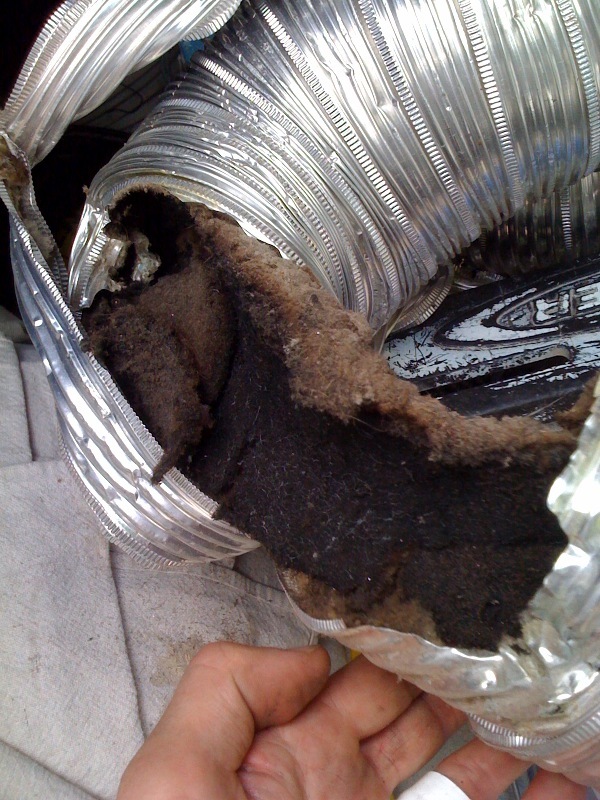 Here you can see a build up of lint around the vent. You van also see where small fires have started in the vent. This home owner was very lucky that there was not a fire started due to this dryer. Nice site. I was looking at this article and accompanying video on repairing a faulty dryer outlet. I noticed from the videos that the NEMA 10-30R receptacle is connected to a 10-2AWG NM cable w/bare ground. In my experience I thought that since the bare ground is now a current carrying conductor it had to be insulated. I know the ground is bonded to the neutral at dryer terminals and from there current is carried from insulated neutral to the receptacle. Am I mistaken? I was thinking this would have to be SE cable and if instead a 10-3AWG was used what do you do w/the bare ground since there are only 3 terminals on the 10-30R receptacle?